I've been trying to figure this out for a while, and it's really bugging me. 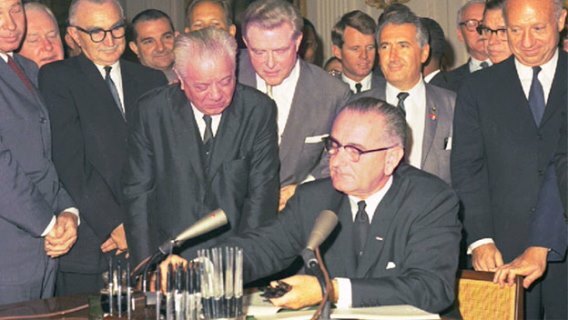 Seeing Robert F. Kennedy (if I'm right) in the background there made me really curious about everyone else around Lyndon Johnson. The guy Kennedy is talking to could be Martin Luther King, Jr., but that's as far as I've gotten. No convenient Wikipedia article about this photo to help me this time. Can anyone identify the people in the photo? Joseph P. Addabbo Sr. ? Credit goes to Tyler Durden on identifying Jacob Javits. There were actually a lot of people at the ceremony - Johnson handed out 72 or so pens as commemorative gifts. TK is Senator Thomas Kuchel. Congressman Peter Rodino (D-NJ) is directly behind Johnson. He has a red lapel pin on. Not the answer you're looking for? Browse other questions tagged united-states political-history identification 1960s or ask your own question. What is “Egyptland” in the context of the 1960s black civil rights movement in the US?